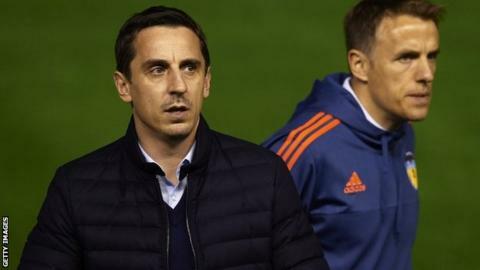 Gary Neville hopes to remain Valencia manager next season after their 2-2 draw with Real Madrid. Neville, who signed a six-month contract, was quoted before the game as saying he did not see his long-term future in management. But after the game with Real, he insisted he was talking about quitting management in 15 or 20 years. "I absolutely hope I'm here beyond six months but I need to prove myself," said the former England defender. The former Manchester United player has picked up three points from four La Liga matches so far. They held Rafael Benitez's title chasers in their best performance yet under him, with Paco Alcacer heading a late equaliser. "The comforting thing is we look fitter, stronger, we're passing it better and we look more compact in defence," said Neville. "There are things that I'm seeing that I believe in. "It was the best performance so far in a number of different ways."